Everyone knows MXR as one of the most iconic stompbox effect companies in history, but did you know that MXR also made a ton of rackmount effects that were used by some of rock’s biggest names? If not, have no fear—we’ve got the rundown for you below, along with a few sweet shots of the vintage rack units we have here at the shop. But recording studios and audio engineers needed something more than a bright orange box. They required higher fidelity and a seriously high-tech look, and they weren’t as limited by pedalboard real estate as live musicians tended to be. 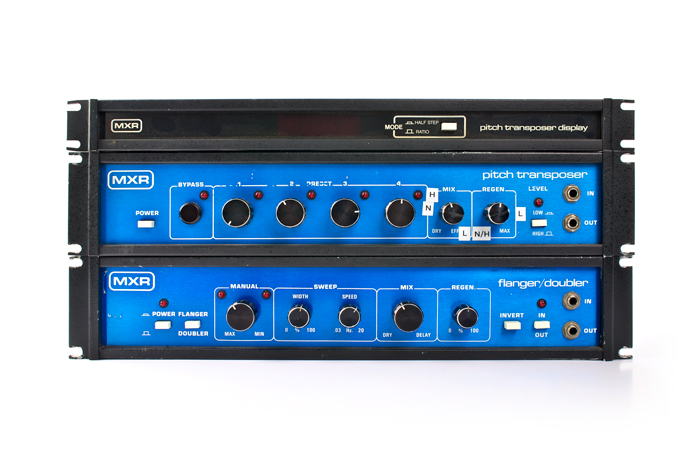 Enter the MXR line of rack effects. 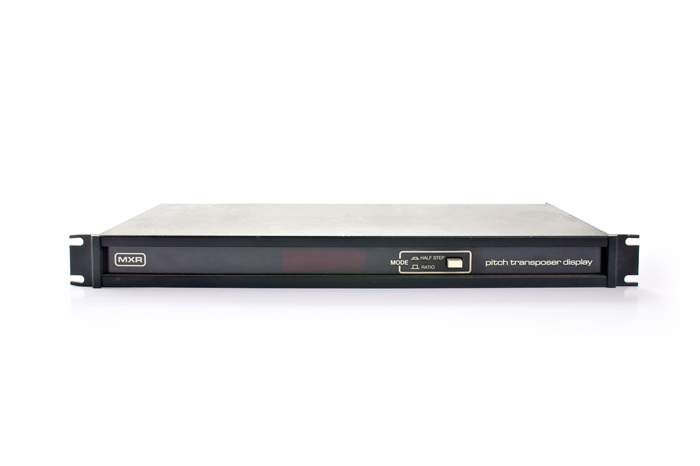 The line began with 2-space rack units such as the M-113 Digital Delay, M-124 Dual 15-Band Graphic EQ, M-126 Flanger/Doubler, and the M-129 Pitch Transposer. These were joined shortly by the more full-featured Delay System II and the M-180 Omni, the company’s first multi-effects processor. The effects boasted state-of-the-art sound in tour-approved enclosures and instantly attracted the attention of the world’s greatest musicians. The MXR Digital Delay and Delay System II in particular found favor with many top stars. David Gilmour stocked his touring racks with both MXR delays. Frank Zappa was also a fan of the “blue face” MXR Digital Delay. Brian May famously demoed his classic “Brighton Rock” echoes with two Delay System II units. The great Jaco Pastorius employed an MXR delay as an early looping device, using the sample and hold function to solo over. Despite the fact that the MXR company fell on hard times in the mid-’80s, the rack effects endured, and found new life with each successive generation of players. The Flanger/Doubler became an integral part of one of the most transformative metal tones of the ’90s when Dimebag Darrell of Pantera made it a central component of his rig. Heavy players the world over flocked to the Flanger/Doubler for the massive tone thickening and widening that Dime made famous. In addition to the 2U effects listed above, MXR also released single-space processors, including the Digital Time Delay. The only thing that tone freaks need to know about this unit is that Eric Johnson, arguably the biggest tone chaser of all time, keeps one on his pedalboard (yes, his pedalboard) to this day. A huge part of the appeal of these MXR rack pieces is the fact that they were all very friendly to guitar signals. Where a lot of rack gear insisted on line-level, low-impedance signals, MXR effects were perfectly happy with the Hi-Z signals that guitars provided, resulting in a very plug-and-play experience. Rather than fuss and futz with other signal processors, guitarists could simply plug in, get great tone, and create with the MXR effects. Whether players know it or not, MXR rack effects made a huge impact on tone in the ’80s, ’90s, and today. The sounds forged in those products live on in the MXR effects of today. Have you ever used an MXR rack effect? This year, Dunlop is celebrating MXR’s 40th anniversary, and we’re taking the opportunity to educate the playing public about the brand with a ton of blog and YouTube content to be rolled out through 2014. Let’s start with some tasty little morsels of information to whet your appetite. Have you ever wondered what the letters MXR stand for? What the first four MXR pedals were? Or what the most popular MXR pedal is? We put together an infographic to answer those and other questions. Check it out below. You can download this infographic as a PDF so you can print it out, or just have a nice big digital copy of your very own: CLICK HERE. Build a better mousetrap and the world will beat a path to your door. For guitarists, that better mousetrap arrived in the early ’70s when Keith Barr gave the world the MXR Phase 90. It was the first of many brightly colored effects pedals that would find their way onto stages and into recording studios worldwide. Barr and his partner Terry Sherwood owned an audio repair shop in Rochester, New York, where they were shocked by the poor quality of the guitar effects their customers brought in. Barr and Sherwood decided they could give guitar players a better sounding, cooler looking, and more reliable stompbox. MXR was born, and the company gave guitarists access to amazing sounds—some of which were previously available only in high-end studios—delivering those sounds in rugged, roadworthy enclosures. The response was immediate and overwhelming. Starting with a few dozen Phase 90s constructed in a basement and sold out of a car at gigs, MXR added three more pedals to the core lineup: the Distortion +, the Dyna Comp® Compressor, and the Blue Box ™ Octave Fuzz. Soon, the growing company was cranking out thousands and thousands of stompboxes and distributing them all over the planet. Guitarists everywhere were plugging into MXR pedals, and those chains of multi-colored boxes became synonymous with out-of-this-world sounds and limitless possibilities. The long list of timeless recordings that feature MXR pedals includes classic tunes by such giants as Led Zeppelin, Van Halen, the Rolling Stones, and many, many others. The vicious distortion on Blizzard of Ozz? MXR Distortion +. Jimmy Page’s “Fool in the Rain” solo? MXR Blue Box. Virtually every song on Van Halen I? Phase 90. Keith Richards’ trippy tone on “Shattered”? Phase 100. The intuitive operation and bullet-proof reliability of MXR pedals ensured that those guitar heroes could reproduce the sounds of their hit records night after night on the road as well as in the recording studio. The music business can be fickle, however, and MXR’s fortunes would shift in the ’80s as other manufacturers began to catch up. MXR closed its doors, but the core products never fell out of favor. Jim Dunlop recognized this, and acquired and resurrected the MXR brand. Fittingly, Dunlop’s first MXR releases were the Phase 90, the Distortion +, the Dyna Comp Compressor, and the Blue Box Octave Fuzz. Dunlop’s acquisition meant that guitarists could once again get their hands on the classic MXR effects, and it also represented a continuation of Keith Barr’s innovative legacy with the eventual release of many new designs. Pedals such as the Carbon Copy® Analog Delay, Custom Badass ’78 Distortion, and Smart Gate® Noise Gate have become modern classics. The Bass Innovations line offers bass players pedals designed with their very specific needs in mind, and the MXR Custom Shop serves as a testing ground for the MXR team’s most ambitious and adventurous ideas. What’s more, the MXR roster now includes classic non-MXR effects such as the Talk Box and the Uni-Vibe Chorus/Vibrato—recreated with dead-on accuracy and imbued with all the qualities that made MXR famous—in addition to several signature effects developed in conjunction with guitar players such as Eddie Van Halen, Slash, Zakk Wylde, and Dimebag Darrell. The 40th anniversary of MXR’s incorporation finds the company more vibrant and exciting than ever, offering dozens of models for guitar players and bass players, with the time-honored effects that got the company started sitting proudly alongside forward-thinking boxes never dreamed of by the founders. The fact that we can’t remember a time when there weren’t hundreds of stompboxes to choose from is due in large part to MXR. The company’s first print ad, which appeared on the back cover of Rolling Stone and featured the then-unheard-of Phase 90, stated simply, “MXR: We Are Here.” Those words are far truer on the 40th anniversary than they were when they were written. The next 40 years will only bring more incredible sounds in neat little boxes to innovative musicians everywhere as the company that created such a big part of the soundtrack of our past provides the tools to take music into the future. Prepare to be amazed all over again. In 2014, we’re celebrating MXR’s 40 years of innovation with a series of mini documentary videos covering its history—from being sold out of a suitcase to appearing on the world’s biggest stages—along with numerous artists, engineers, pedal designers, and original MXR personnel telling stories of sonic inspiration and discovery. Start below with the trailer for just a small sample of what’s to come; then watch our inspiring interview with MXR founding employee Ron Wilkerson, who explains the creative, business and technical enthusiasm that drove MXR’s formative years; and then watch as guitar hero Paul Gilbert recounts his first experiences with MXR effects, and explains how the right effects can influence experimentation and inspiration.